మారుతి ఎర్టిగా 5 వేర్వేరు రంగులలో అందుబాటులో ఉంది - Pearl Arctic White, Metallic silky silver, Pearl Metallic Auburn Red, Pearl Metallic Oxford Blue, Metallic Magma Grey. 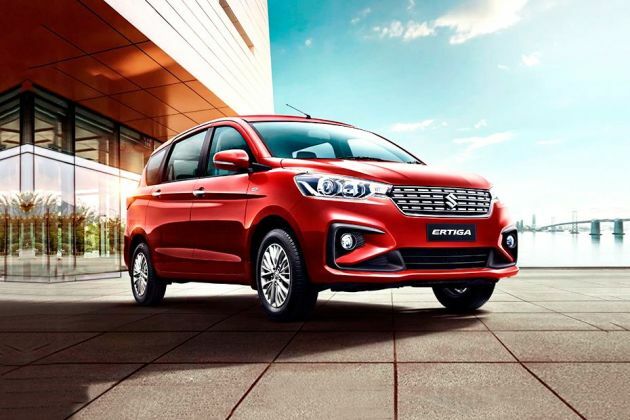 Clash Of Segments: Maruti Ertiga Vs Maruti Ciaz- Which Car To Buy? Handling is awesome with great features in it. I got this car recently, til now fantastic and mind-blowing interiors. A good family car for 6 peoples. This Car is the best in this segment with affordable price and good mileage. If we talk about the interiors the air conditioner is awesome. Air-Conditioner is good and feels like SUV. Smart Car in a low Budget. Simply a Family car within the budget. I was planning for XUV 500 and bought this in February. Suspension needs slight improvement, but the features are fine. Best car for a family. రాబోయే ఏర్టిగా Dreza బహిర్గతం అయ్యింది. జైపూర్: మారుతీ ఎర్టిగా ఫేస్6లిఫ్ట్ అక్టోబర్ 15న విడుదల కి సిద్దంగా ఉంది. ఇండొనేషియా ఆటో ఎక్స్పో లో ప్రదర్శితం అయ్యినప్పటి నుండి కొంచం ఆలస్యమైంది. ఇదే కాకుండా ఈ కారు అప్పుడప్పుడు దేశంలో కంటపడింది.